Adds a snowy visual effect to the player and NPCs when snow is falling. Effects all live and deceased NPCs and wildlife with-in a set radius. Just PM me to let me know you enjoyed. fixed snow effect appearing in Eldergleam Sanctuary, by adding a GetInWorldspace check for Eldergleamsanctuarywold. If you like this mod, you might also like Wet & Cold by isoku. Version 4+ entire character gets snowy. Version 5.5+ no snow on skin (not as consistent as ver4). Get Snowy doesn't do everything, and it never will because it doesn't use scripts at all. Meaning No Save-Bloat, No Crash to desktop, No need for SKSE, and a simple safe uninstall. It's not required to run Get Snowy but it stops brawls from bugging into real fights. - Upgrading from ver 4 to 5. The no-skin-snow feature doesn't work until the 2nd time it snows. - Install the Brawl Bugs Patch to avoid issues with brawls. - FYI: How to temporarily remove the effect if you need to. - This will work with all weather mods, provided that the precipitation classification is set to "snow"
Should be compatible with pretty much anything else. Q1: "The no skin-snow feature doesn't work sometimes (mostly NPCs)?" --- Yes, unfortunately this is due to engine limitations. If it's immersion breaking I would suggest using ver4+ which is much more consistent. Full explanation: To remove the snow i have to apply a 'skin only' shader after the Snow-shader has been applied, sometimes due to CPU cycles the skin shader sneeks in before the snow shader. I'm doing conditional checks but the spell system is rather limited. Q2: "The effect doesn't appear, or looks strange, on [x] item from [x] mod." ---- This is a defect with the model, not the behaviour of the membrane shader applied by this mod. Q3: "Can you change the effect to be more/less snowy?" 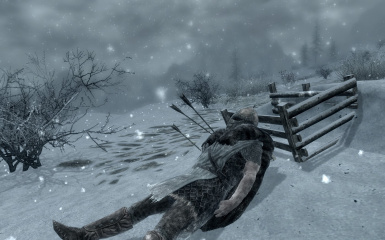 Q4: "The snow effect appears in the Ash rain from DragonBorn. Why wont you fix it?" ---- (1) I'm not that interested in DragonBorn. (2) I'd have to re-release new versions of my mod with DragonBorn as a master, which will only make future updates and version-control a pain im not willing to suffer. (3) It's only an issue because Bethesda lazily set-up their ash-rain as snow, rather than making a new precipitation-classification. A new compatibility patch written by UnmeiX for Wet'n'Cold-Ashes is now available in the downloads. 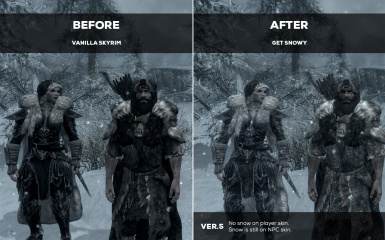 - Introduction of a new feature to remove snow from skin on NPCs. - NOTE: due to the nature of the engine and my goal to not use scripts this feature is not as consistent as I would hope. - Fixed snow effect appearing in East Empire Trading Company by adding a GetInWorldspace check. - Introduction of a new feature to remove snow from skin. - NOTE: I'm working on implementing the same feature for other actors. - fixed snow effect appearing in parts of Labyrinthian by adding a GetInWorldspace check. - slowed down fade-in and out times. - renamed the .esp (last file rename i will do) so that people don't have to issues installing future versions. 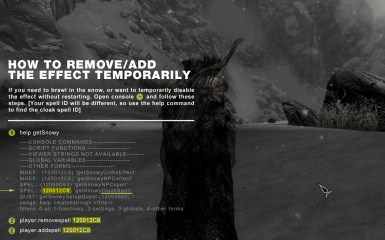 - fixed snow effect appearing in Eldergleam Sanctuary, by adding a GetInWorldspace check for Eldergleamsanctuarywold. - release; met with fanfare and fireworks! I recommend saving inside, out of the snow, first. 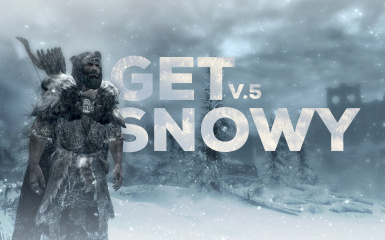 - what version of get snowy are you using? - please post a screen shot. - What is the location? - in console type "isSnowing" does it return 1 or 0? - in console type "player.isInInterior" what does it say?